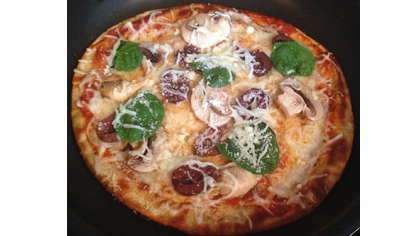 Make a great-tasting pizza in less than half the time! Heat nonstick pan over medium low heat. Brush olive oil on one side of pita and place in pan oil side down until lightly browned. Brush oil on second side of pita and flip. Turn pan to lowest setting and spoon sauce, cheese, and toppings on pizza. Place lid on pizza and allow cheese to melt. Transfer to plate and sprinkle with Parmesan cheese.